This customized cat shape bottle opener keychain easily purrs your logo and positions it in limelight. If your company is unwilling to accept failure, then feel free to grab this cat shape bottle opener keychain and start acting immediately. You don’t need to feed it, comb it or get it vaccinated, because this cat bottle opener keychain is made up of durable stuff – aluminum. It is going to serve you longer than any other budget gift you have ever seen. It makes a great pet marketing tool for pet owners clubs, pet owners associations, pet supplies stores, individual and big budget pet practices and many more. 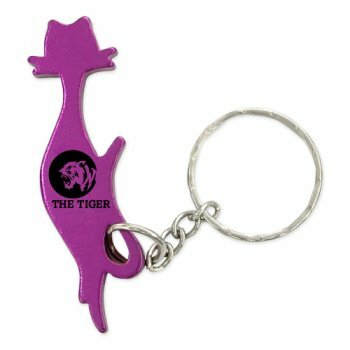 Request a quote to know wholesale price savings on custom cat shape bottle opener animal keychain. Available colors - Metallic Black, Metallic Blue, Metallic Gold, Metallic Purple, Metallic Green, Metallic Red and Metallic Silver. Imprint area – 1/2" x 1/4".